The filmmakers film Equal Means Equal has become a movement in a time where women are speaking out more often about sexual abuse in Hollywood and in all areas of business. "The fight for women’s equality is the defining civil and human rights struggle of the 21st century. The Equal Rights Amendment is that which begins the change and that without which no change is possible." On Sunday, November 12 – at 10:30 am actress, filmmaker turned activist Kamala Lopez (Born in East L.A., Equal Means Equal) will launch the “Silent Sentinel Challenge” a daily demonstration taking place in front of the White House starting Monday, November 13, thru Sunday, January 21, continuously from 10:00 AM - 6:00 PM Monday - Saturday. The “Silent Sentinel Challenge was created to raise awareness of the fact that women and girls do not have Equal Rights in the US Constitution. Lopez has partnered with artist Natalie White, the artistic director of EME and spokesperson for Catharsis on the Mall. Lopez said, "The fight for women’s equality is the defining civil and human rights struggle of the 21st century. The Equal Rights Amendment is that which begins the change and that without which no change is possible. On this centennial anniversary of the historic Suffrage protests of 1917, we must honor the past by forging into the future with urgency and determination." The launch of the challenge will commemorate 100 years of the Suffrage protestors of 1917 and will highlight the 32 women arrested during the “Night of Terror” in 1917. A short history as well as excerpts from the Congressional testimonies from the Suffragists will be read and the event will end with the premiere of the new ERA anthem, “We Can Do It," written and performed by Patricia Bahia & Ali Handal. Other celebrities invited to attend are actress, host, Suzanne Whang (HGTV House Hunters), actress and model Lizzy Jagger (Being Mick) and, Actress Ann Mahoney (The Walking Dead) who have all confirmed; Actress Kerry Cahill (The Walking Dead), model Theodora Richards, Lily Tomlin, and Jane Fonda (tentative but not confirmed). 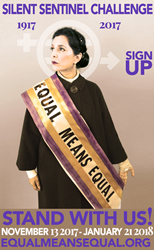 Actress, filmmaker, activist and President of Heroica Films, Kamala Lopez, has launched the movement and film Equal Means Equal, to educate Americans about the importance of equal rights under federal law for women. Born in New York City to an Indian mother and a Venezuelan father, Lopez has worked as an actor in over thirty feature films including Born in East L.A., Deep Cover, The Burning Season (winner of 2 Emmys, 3 Golden Globes and the Humanitas Prize), Clear and Present Danger, Lightning Jack, and I Heart Huckabees. She has starred in over sixty television shows including Medium, 24, Alias, NYPD Blue, Hill Street Blues, Miami Vice, and 21 Jump Street (winner of the Imagen Award). She hosted the PBS series Wired Science. Lopez, a Yale University graduate in Philosophy and Theatre Studies, formed production company Heroica Films in 1995 with the mission to write, direct and produce media for women, about women and utilizing women both in front and behind the camera. Her film, A Single Woman, about the life of first Congresswoman Jeannette Rankin, won the 2009 Exceptional Merit in Media Award from the National Women’s Political Caucus. In 2013 her short Spanish-language film “Ese Beso” won the Jury Award at the Senorita Cinema Festival and the Audience Award at the Boyle Heights Latina Film Festival. In 2009 Lopez began the ERA Education Project, creating multi-media PSA’s, video FAQ’s, social media campaigns, educational videos & sites, piloting curriculum and travelling around the country speaking to groups as well as students in colleges and high schools. She has been the Keynote or Featured Speaker in venues as disparate as the Smithsonian Institution’s National Portrait Gallery, the United Nations, The National Arts Club, at the YaleWomen Global Conference as well as to “at-risk” girls and other children in L.A. Mayor Villaraigosa’s Partnership for Los Angeles schools. Lopez’s work on behalf of women and girls has been recognized by Los Angeles County’s Board of Supervisors and the Women’s Commission who named her 2015 Woman of the Year (Arts/Media). In 2012 Women’s eNews selected her as one of the 21 Leaders for the 21st Century and the National Women’s Political Caucus named her the 2011 Woman of Courage. In 2016, the State of California awarded her the Latino Spirit Award for Achievement in Advocacy and Entertainment and the national civil rights group Equal Rights Advocates named her Champion of Justice. Equal Means Equal is a labor of love that Lopez embarked on over eight years ago when she first realized that women still did not have Constitutional protections in the United States and that most Americans did not know that.